Touching on a point we addressed over the weekend when looking at real, "as reported" vs non-GAAP, "adjusted" profits, in his latest note Albert Edwards makes the following observation: the latest surprisingly poor capex/investment component of Q3 GDP is an ominous sign for both US growth and corporate profits, and comes at the worst possible time for the US economy: just as the beneficial tailwinds from Trump's fiscal stimulus fade, and become headwinds. As Edwards explains referring to the latest Q3 GDP print, "despite extremely high levels of corporate optimism on the back of Trumps fiscal reforms, business investment (including inventories) has not been a key driver of the stronger economy, as it contributed less than 1pp to the 3% GDP yoy growth." 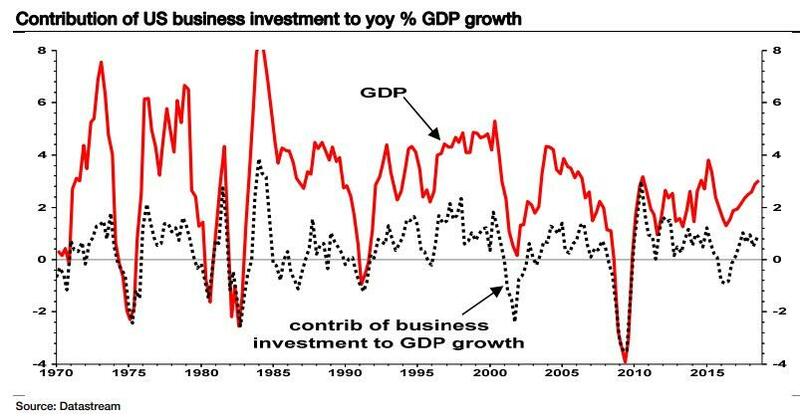 Furthermore, and record business confidence aside, Edwards argues that "the subdued pace of business investment is what you would expect given the surprisingly moderate underlying profits uplift, as shown by the BEA National Income Accounts (NIA) measures of profits." But how does this strangely subdued measure of NIA Whole Economy "as reported" profits square with the near record adjusted earnings growth (as S&P corporations report on a non-GAAP basis) and the booming stock market measures? "Not much it appears" Edwards responds rhetorically, and adds that if one looks at a wider definition than the domestic non-financial profit series shown in the left-hand chart below, things are no different. In fact, "they are actually worse. In the right-hand chart for example, we compare NIA Whole Economy national (ie including profits from abroad) pre-tax profits (as reported) with yoy growth in stock market profits." And as the SocGen strategist exclaims, "The recent divergence of the two series is astounding. " Both the two NIA Whole Economic series shown above in red are pre-tax measures of profits. Despite taxes being slashed, it is still reasonable to focus on this pre-tax measure as this definition probably best explains growth in domestic business investment. But certainly on the right-hand chart above I am comparing apples and pears (although both are as-reported and the pre-tax measure is telling us something useful about the underlying profits performance). To address this divergence, Edwards therefore shows the level of both pre- and post-tax national Whole Economic Profits on a reported basis in the chart below (the red line below is the same definition of profits as the red line in the chart on the right above). What he finds is that even on a post-tax, reported basis "the recent rise in NIA whole economy profits has been somewhat subdued (blue line below) when compared with stock market measures." Why does this matter? Because as Edwards explains, "quite often we find the NIA Whole Economy profits measures are more reliable than the heavily manipulated pro-forma reported company eps." Putting it all together, Edwards writes that the ongoing weakness in both business investment and "as reported" profits comes at the worst possible time: just as President Trumps "ill-timed fiscal incontinence is set to abate as we move into 2019 (caveat: the stimulus may have been ill-timed for where we are in the economic cycle, but it certainly was perfectly timed for the electoral cycle where the strong economy featured prominently)." 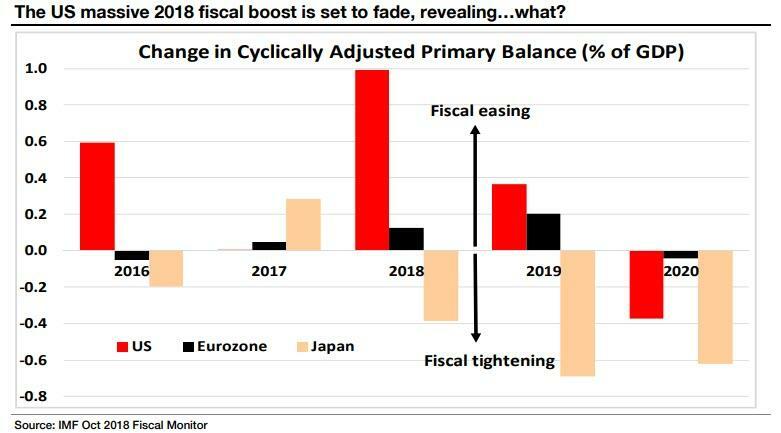 And, as Edwards concludes rhetorically, "if this is as good as it gets" for profits and business investment, "what happens next year when the sugar rush of fiscal expansion begins to wear off?" That is one question whose answer president Trump will have absolutely no desire in seeing answered, especially now that the Democratic House has assured that any future fiscal stimulus to maintain the economy's sugar high is virtually impossible.